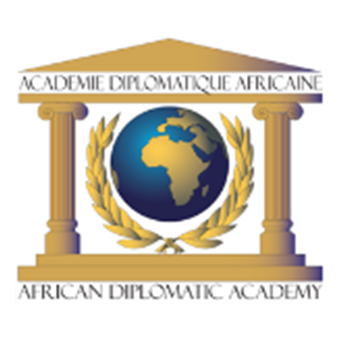 The AFRICAN DIPLOMATIC ACADEMY (ADA) was set up in 1999 in Senegal where it has a headquarters agreement. It’s International Secretariat is based in Dakar (Sénégal/West Africa) and in Paris (France).From its inception the ADA has been placed under the aegis of the African Jurists Association, a Non Governmental Continental Organization presided over by Dr. Benoit Ngom which with an observatory status at the Organisation of African Union since 25 years. The ADA shall endeavour to promote an African Diplomacy Approach to ensure lasting development in peace and good-governance. The ADA also serves as ‘THINK-TANK‘, gathering experts and intellectuals specialized in the field of Diplomacy and International Relations as well as that of an Independent ‘LOBBYING GROUP’ in favour of the African continent. ADA’s foundations are beyond racial and language divisions, nor ideological boundaries in order to facilitate concertation and dialogue which is a prerequisite to heads of states divisions, and a fruitful dialogue with the rest of the world in order to promote politics of cooperation based upon respect and a mutual knowledge. It’s a privilege tool of exchanges and discussions for diplomats or officials wanting to act in favour of the African continent. Thanks to its scholars, its researchers, the multidisciplinary seminars and its annual conference, the ADA wishes to contribute to better foresee and better monitor conflicts in Africa. Finally the ‘ADA’ wishes to set up CONSULTATION FORAS with a role complementary to and in support of the African Union (AU), as well as other sub-regional African organisations, in order to favour prospecting reflections on vital issues concerning the African continent and contribute to the harmonization of their politics, to contribute to the promotion of Africa and the Prevention of conflicts through international sensitisation campaigns highlighting all issues relevant to the future of Africa as well as enhancing ties with the African Diaspora. Accordingly, the ‘ADA’ wishes to co-operate with all International Organisations acting in favour of the development of the African continent. ADA members are prominent political, socio-economic, diplomatic and academic personalities alongside other international personalities concerned with the future of the African continent. ADA – diplomatic conferences – diplomatic clubs – annual awards – official web site and news letter. 16. M. Pascal BONIFACE General Manager the Instititute of “ Institut des Relations Internationales et Stratégiques “ Paris.